30 DIY Kitchen Hacks That Will Improve Your Kitchen Big Time! If there is one space in the house that is busy, that would be the kitchen. We prepare food not just three times a day but more than that. Sometimes, we work for long hours in preparing and cooking something. But sometimes, we work for a few minutes only. Whatever length of time we spend in the kitchen, one thing is for sure, we spend time working in this space and we want everything to be in order and we want to do things in the easiest way possible. That is why this diy kitchen hacks is here for you to get some ideas. That is why you need this list of kitchen hacks because it will improve not just your kitchen space but how you work in the kitchen. It would be easier to have things in proper order and to maximize the space as well for storage. 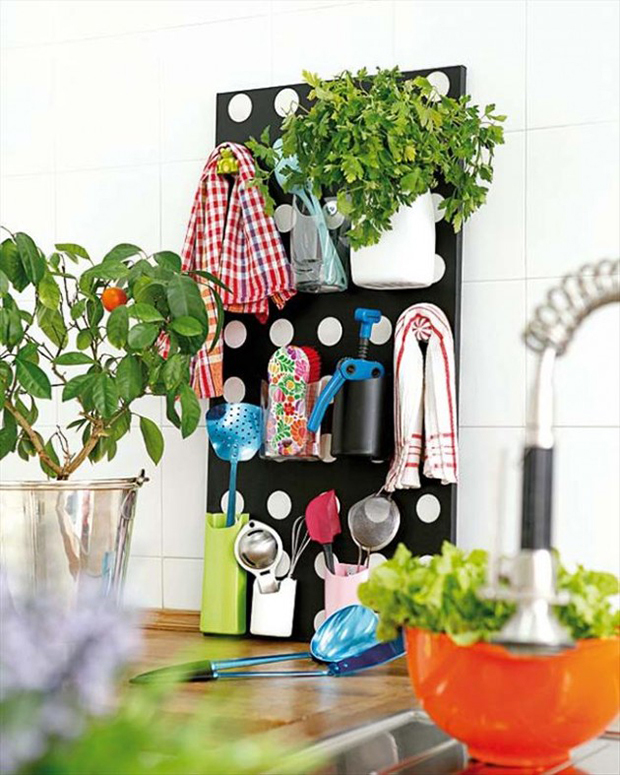 There are many kitchen hacks that we can find that is easy and will also help us recycle some stuffs that are already existing in the house. So, check this list and prepare to have a better kitchen space once you try the hacks below. 1. 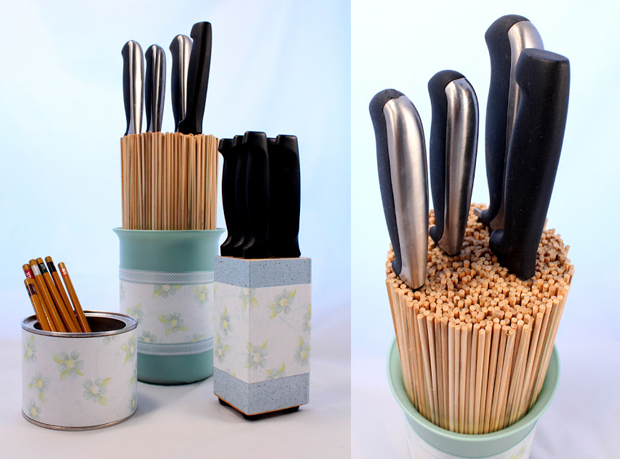 Use a bunch of bamboo skewers for knife storage. For sure, you will never find it hard to insert knives. 2. 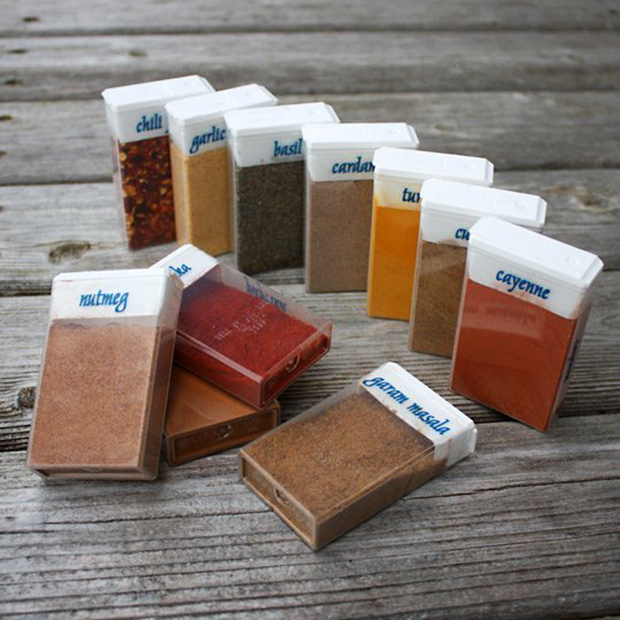 You can use empty Tic Tac containers as spice storage. Don’t forget to add labels too. 3.Don’t throw your cans away for they can be a lovely wall storage. Just attach them to a wood and you are done! 4. 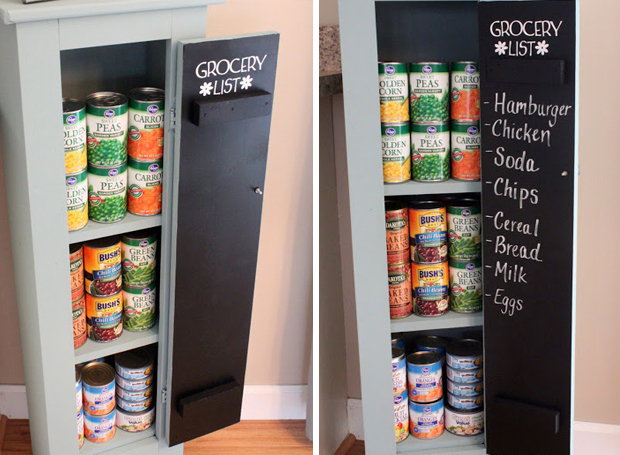 Paint the insides of a cabinet so it can be a chalkboard painted grocery list that you can write on and erase. 5. 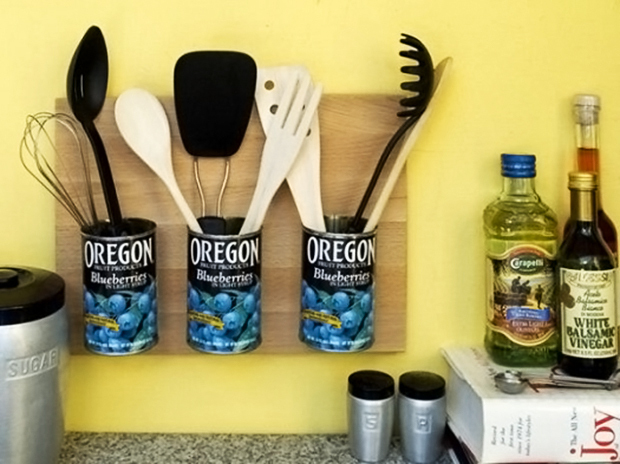 Make your own kitchen utensils organizer using a corkboard and containers. Such a fun way to recycle! 6. 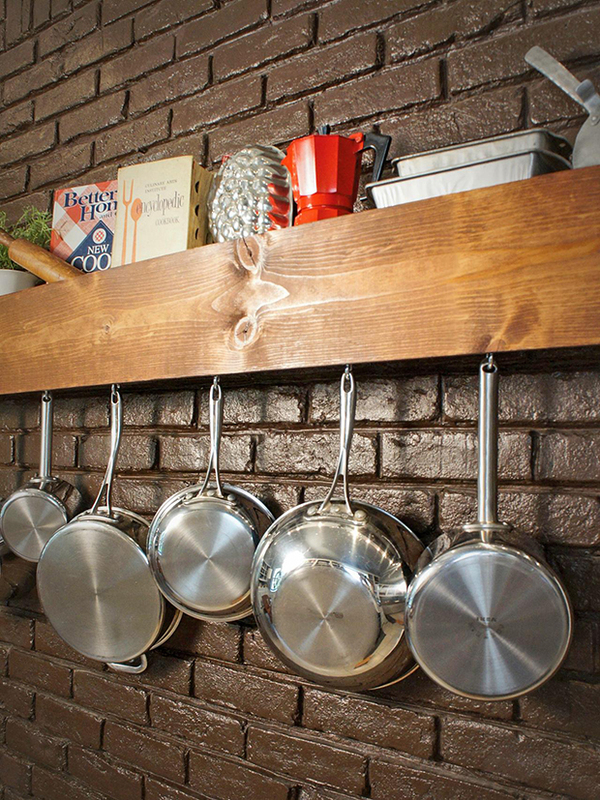 Use a gutter and some wood to make a DIY shelf and pot storage for your kitchen. You’d certainly be organized this way! 7. 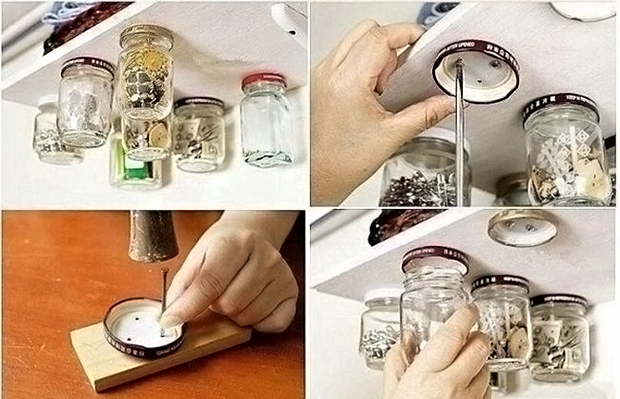 Add a storage under the shelf using jars simply by mounting the lids under the cabinets. Simple yet amazing! 8. 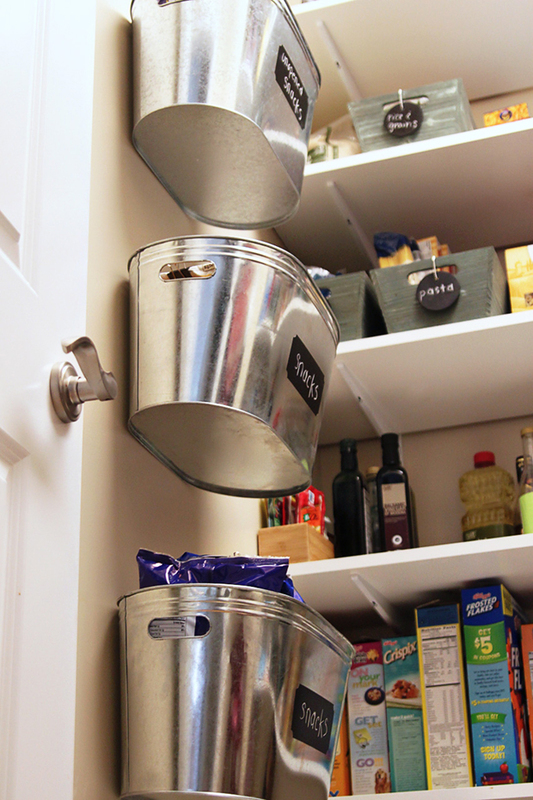 Attach metal storage bin to the wall and put some labels to organize kitchen stuff. 9. 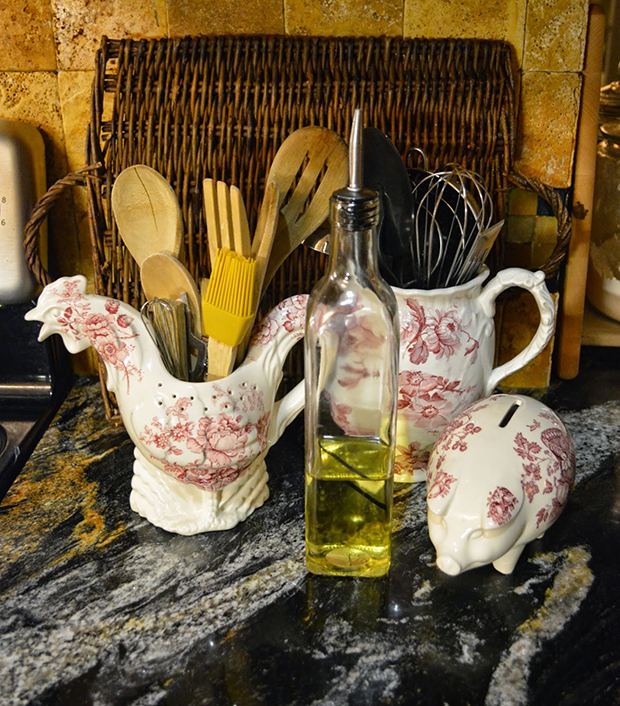 Store your kitchen utensils in a ceramic for a fab looking space! 10. 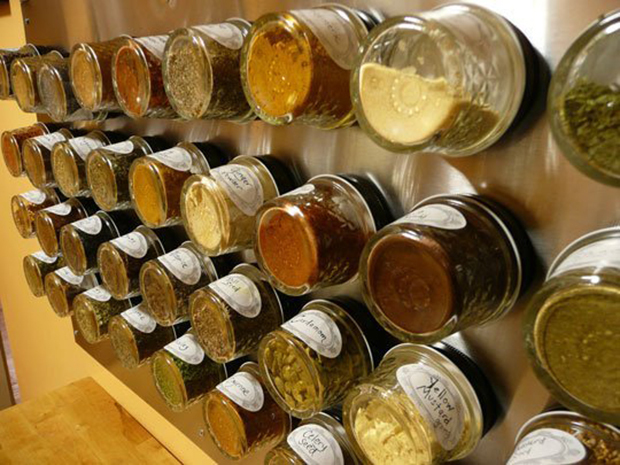 Make use of that wall space by adding some magnetic wall spice storage like this. Isn’t it amazing? 11. 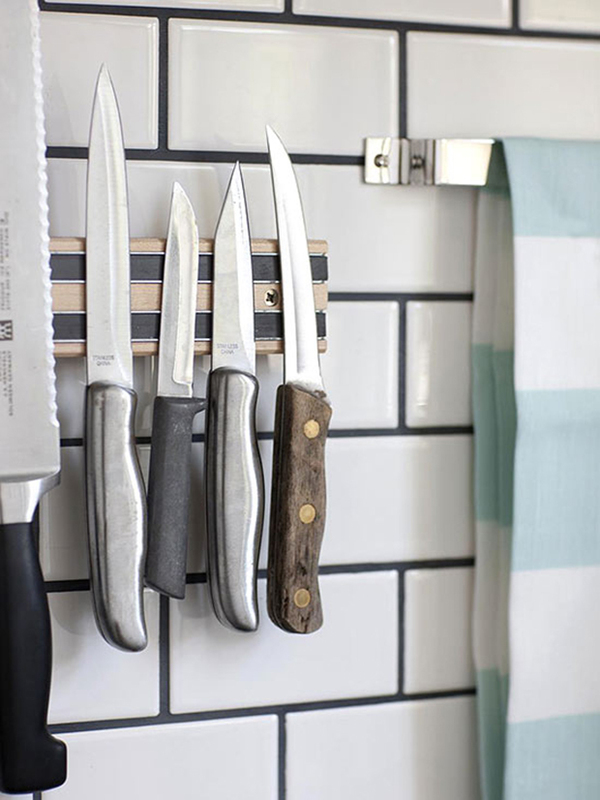 Add a magnetized strip for knife storage on your backsplash. 12. Got an old door? 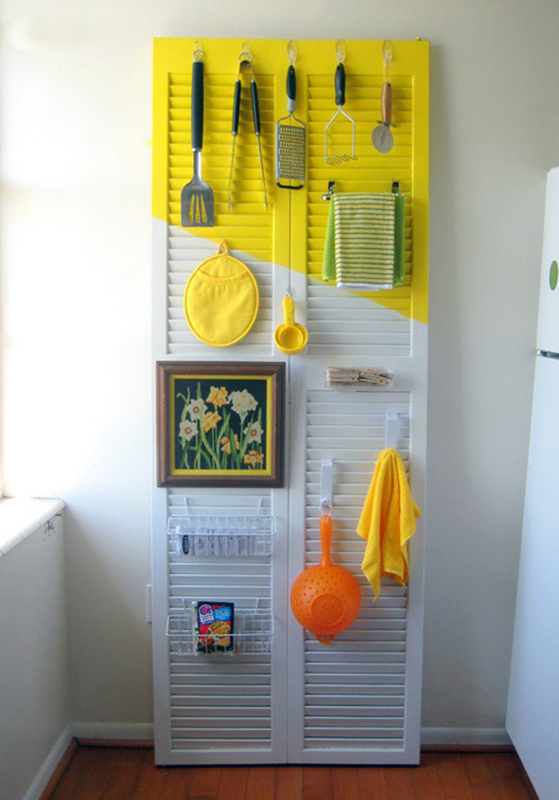 Add some hooks so you can hang some kitchen items there. 13. 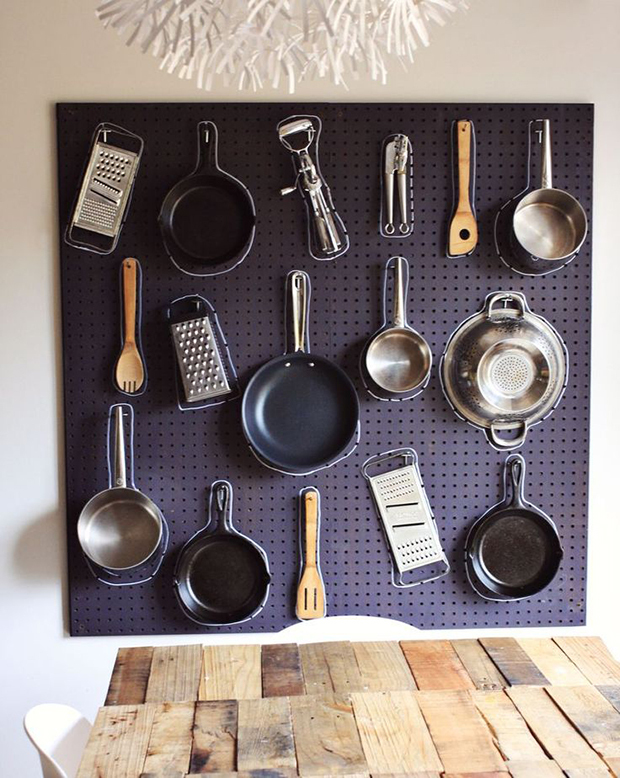 This peg board looks fun! The chalk traces around each item will remind you where that pan goes. 14. 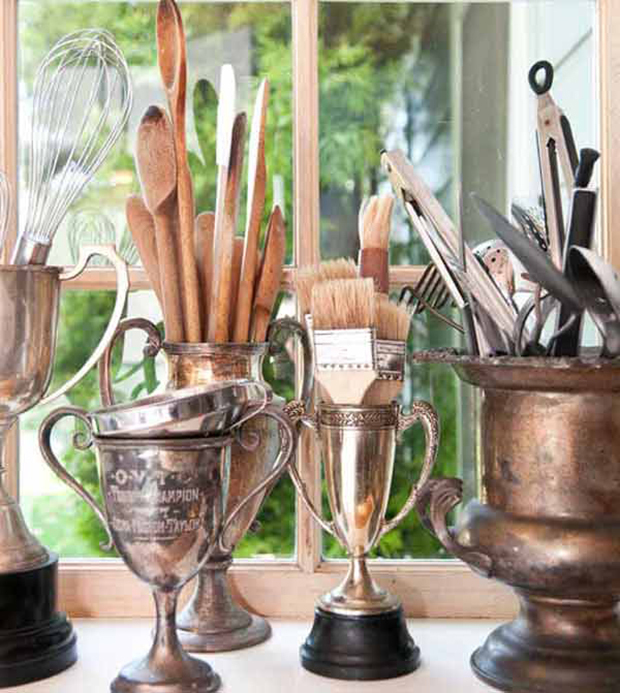 Your kitchen will look beautiful by using vintage trophies as storage for your utensils. 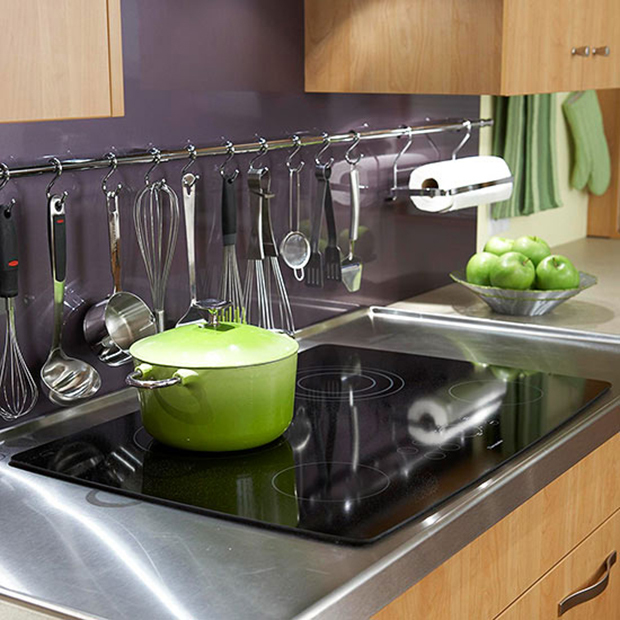 15.Install a stainless-steel rod with S hooks where you can hang your utensils. You would never dig into a drawer ever again! 16. 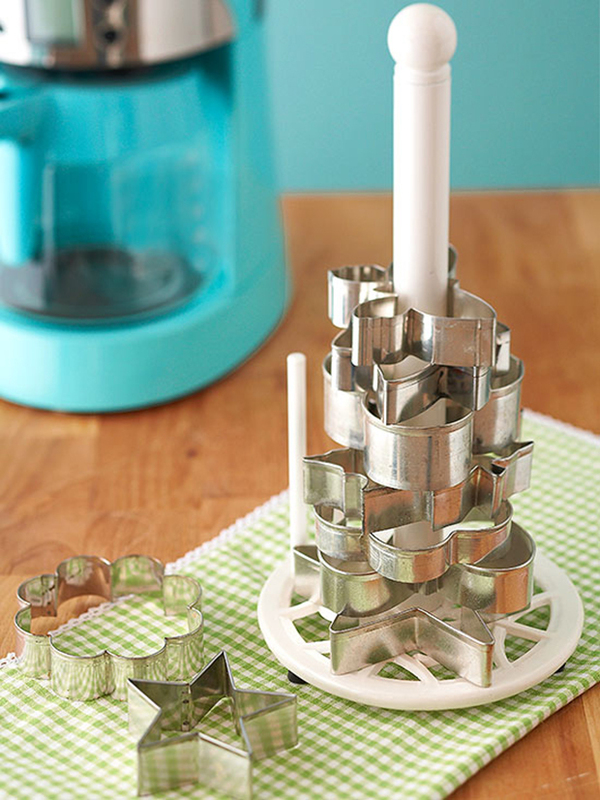 Keep your cookie cutters in a paper towel holder. They’d never get lost for sure. 17. 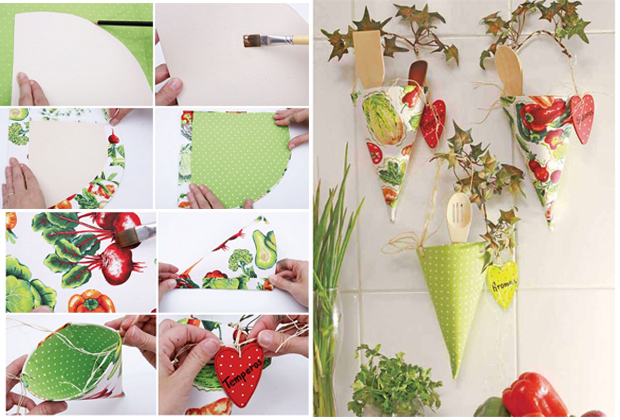 Make lovely fabric cones with a board backing and hang them on the wall. Cute idea, right? 18. 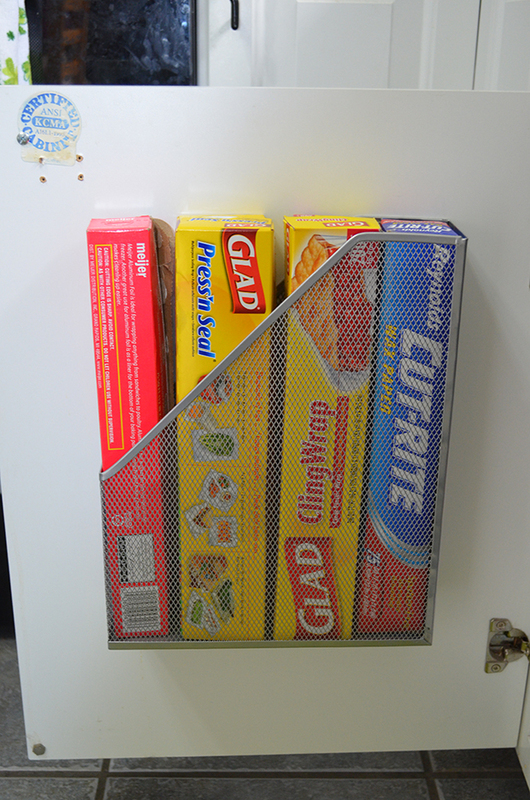 You can store your tin-foils and other items in a magazine rack. Attach it in your cabinet door. 19. 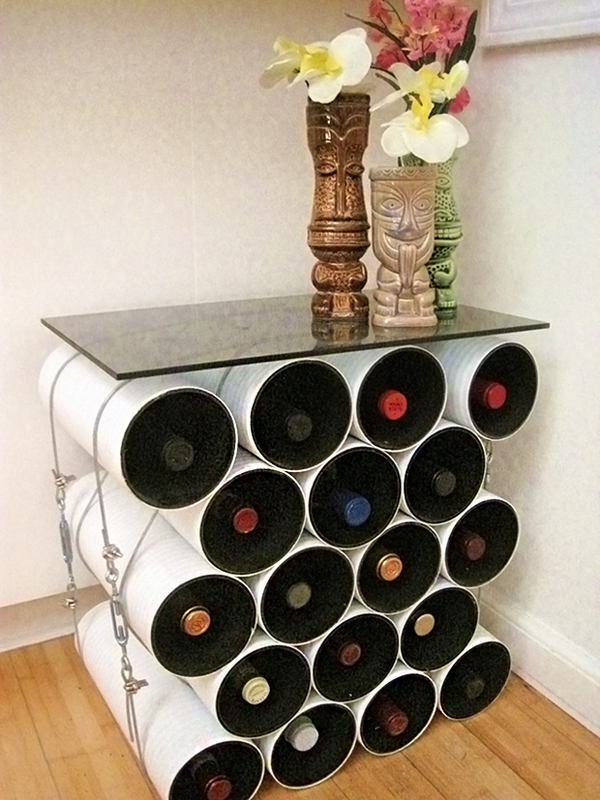 This DIY Pipe Wine Storage Table is an amazing idea to store your wine. I think oat meal boxes can work well for this too. 20. 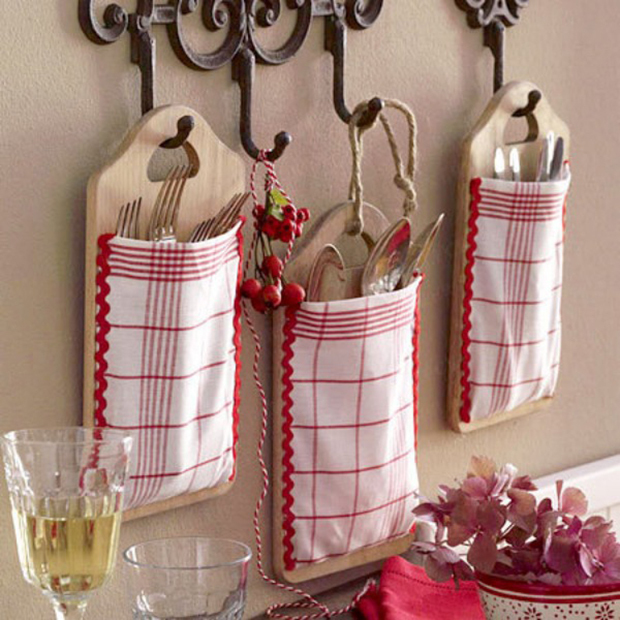 Make a cutlery hanging pocket using fabric and a wooden chopping board then hang them! 21. 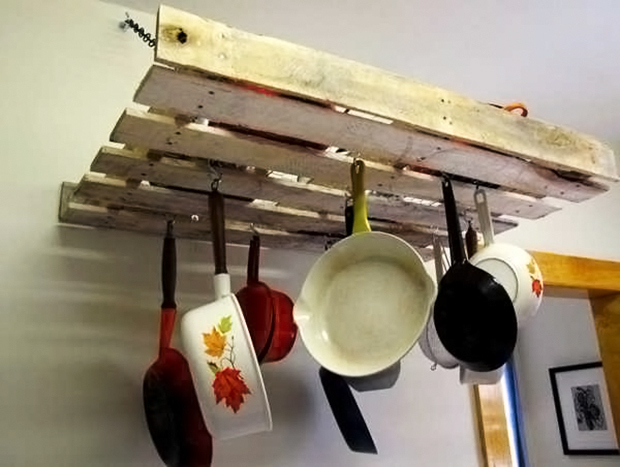 Turn a wooden pallet into a shelf and a place to hang your pots. 22. 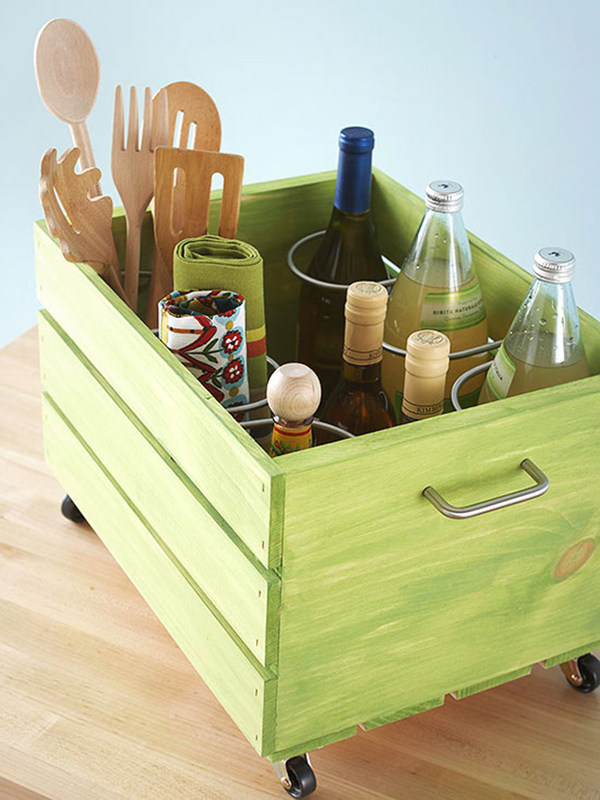 Paint a wooden crate and add some wine bottle holder inside it so you can store bottles of wine or even cooking oil without spills. 23. 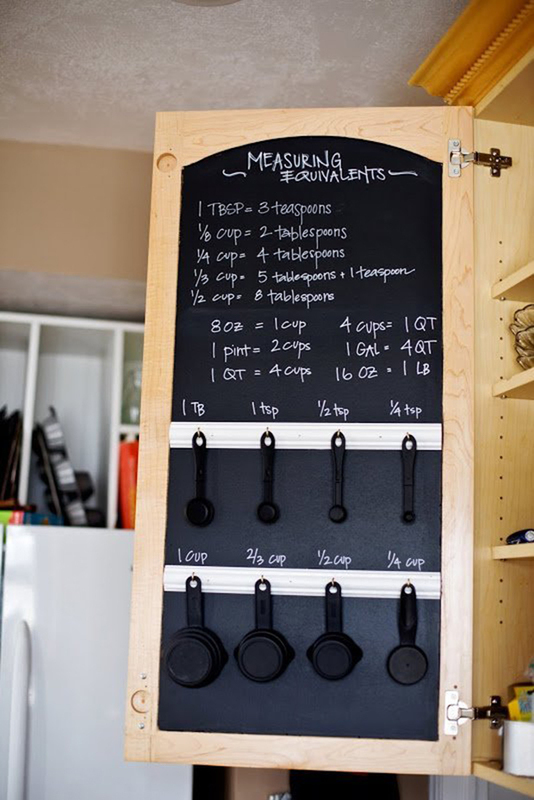 This is a clever idea to store measuring cups by painting the back of a cabinet door with chalkboard paint and hang the cups on hooks. 24. Got some excess food? Worry not. You can keep them by using hanging clips. It would remain crunchy! 25. 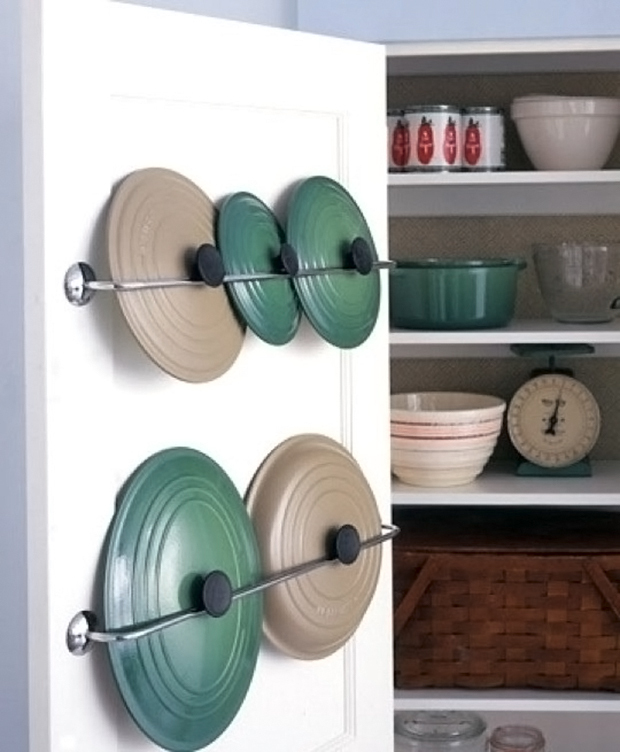 Never lose your pot lids again by using a towel rack for lid storage in your cabinet door. 26. 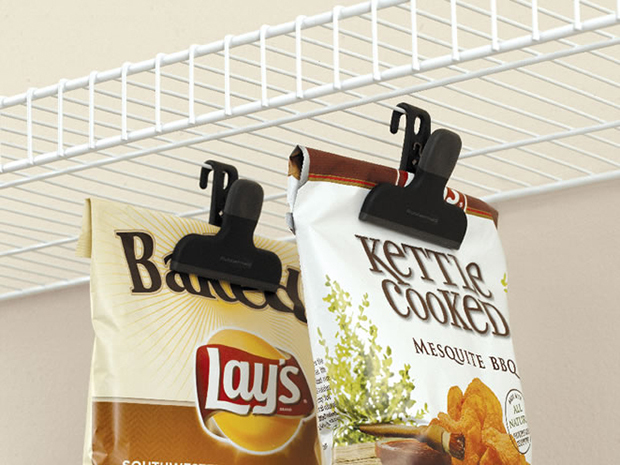 Your trays will not be scattered anymore using a tension rod to keep them organized. 27. 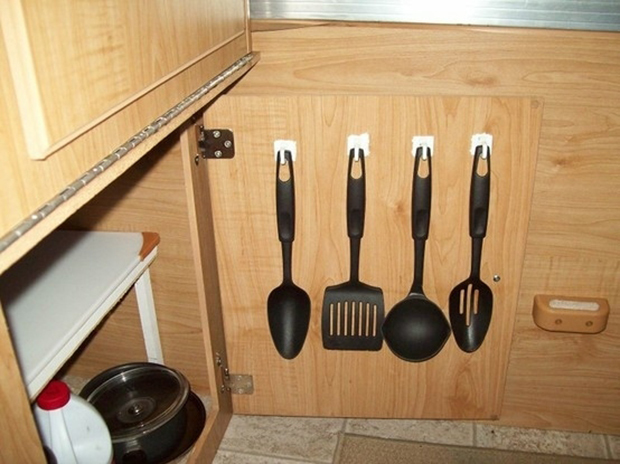 The insides of a cabinet can be used to keep pot holders, gloves, utensils and others by adding some hooks into it. 28. 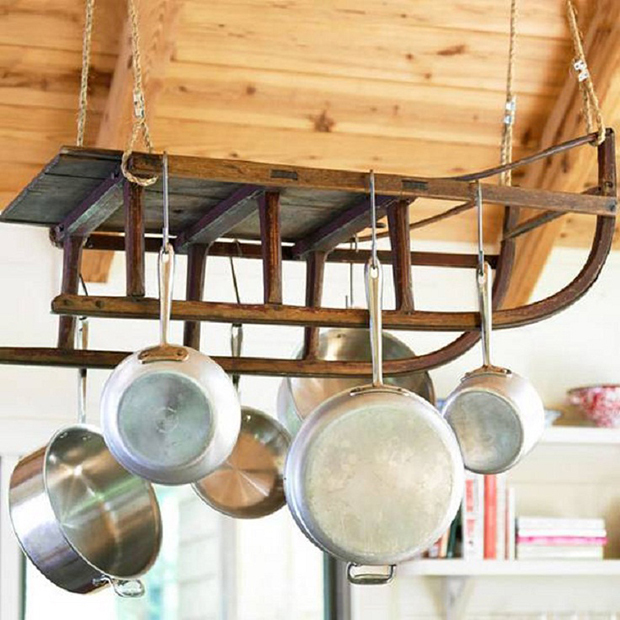 Another good way to store pots is to hang them from the ceiling and they will look like decors at the same time. 29. 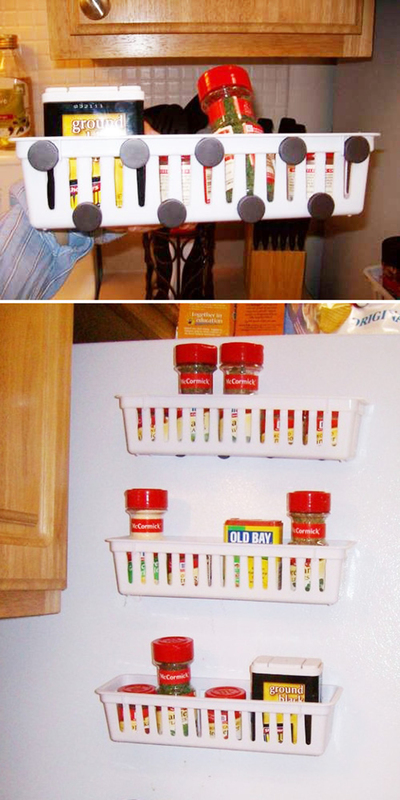 To store your spices or some items in the kitchen, stick magnetic racks to the side of your fridge. 30. 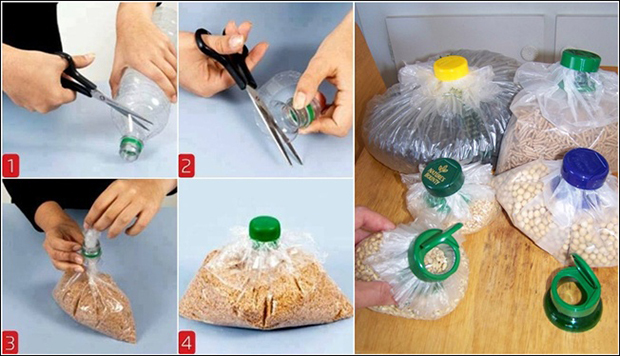 Well, the instruction is clear on how to use a cellophane and upper part of a bottle to store various goods in the kitchen. Didn’t we tell you that this will improve your kitchen? I’m pretty sure that if you apply some of the tips above, your kitchen will be more organized and functional. Also, you will be able to work better too. Who would think that even cans and bottles can save your kitchen? Just be creative and nothing is impossible! If you liked this list, share this post to your friends too. They will surely get new ideas from this! FREE TRENDING HOMES IN YOUR INBOX! Never miss any updates! Subscribe to our feed and we'll send you the latest trending homes right to your inbox daily! Join us Now! If You Think A Clock Is Nothing But Tick-tock. These 15 Kitchen Clocks Will Prove You Wrong. Get All These Kitchen Appliances and Gadgets. Let’s See If You Still Have Money Left To Buy Food. Here Are 10 Structures Made From Bottles. #3 Is Pure Genius! WOW. If You Think Geometry Is Boring, This Futuristic Apartment Will Make You Love It. Believe It Or Not. This Resort Allows You To Sleep Underwater. Don’t Worry You’ll Come Out Alive. Boring Walls? Why Not Gather Wall Frames on the Corner! 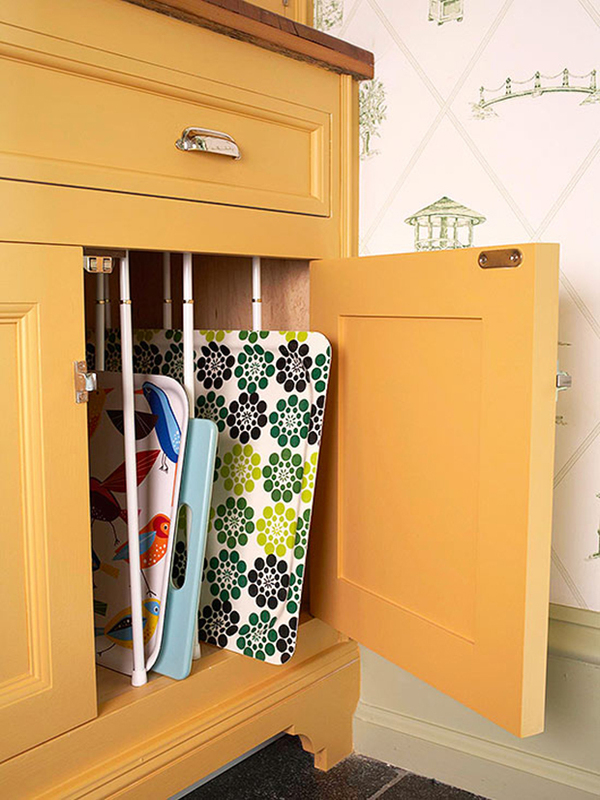 Got a Kitchen Corner Storage Problem? Here are 20 Solutions You’d Definitely Find Useful! Spectacular Swimming Pools in the World You’d Love to Dive In, Except # 22. Join Us in Facebook Now! Copyright © 2019 Viral Homes.